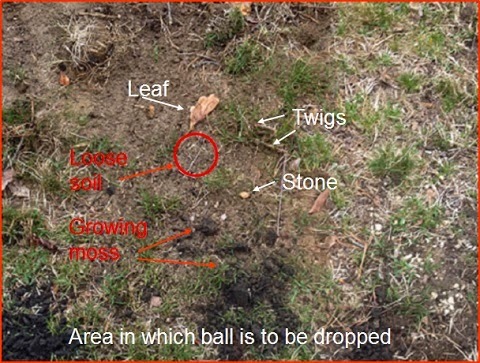 Should you mark the outside extent of where you are permitted to drop your ball? Whilst the Rules do not require you to mark the permitted area (e.g. within two club-lengths, not nearer the hole, for one of the options for taking relief under penalty of one stroke for a ball that is deemed unplayable; or within one club-length of the nearest point of relief, not nearer the hole, when taking relief without penalty from an immovable obstruction), it is wise to do so if you want to take advantage of the full area of relief. If you do not and your ball first strikes the course outside of the permitted area, you will be playing from a wrong place if you then make a stroke at your ball. Rule 20-2b. May you remove loose impediments from the area before dropping a ball? You are permitted to move any loose impediments, such as leaves, twigs, stones, droppings etc., but remember that loose soil and sand are not loose impediments, except on the putting green. It would be wrong to use a brushing motion to clear away leaves from the dropping area, as that would inevitably mean moving loose soil at the same time. So, the loose impediments should be picked off in this situation. Rule 23-1. May you improve the area of intended drop in any other way? Apart from moving loose impediments you may not improve, or allow to be improved, the area in which a ball is to be dropped. This includes; pressing a club on the ground; moving, bending or breaking anything growing or fixed; creating or eliminating irregularities of surface; removing or pressing down sand, loose soil, replaced divots or other cut turf placed in position; or removing dew, frost or water. Rule 13-2. May you clean the ball before dropping it? Yes, the ball may be cleaned. Rule 21. May you ask a fellow competitor, opponent or outside agency what options you have before making your drop? Yes, information on the Rules is not advice. Definition of Advice. Remember that when you drop a ball in the correct way and at the right place it may still roll to a place where it has to be re-dropped under the Rules. I will cover this in a separate blog in the near future. Thanks to those of you that purchased one or more of my three quizzes after last week’s blog. For those of you that were going to order but never got round to it, here is the link again. ($8, €6 or £5). Good article about dropping a ball. While this may be somewhat arcane, it should be noted that whatever club you use to determine the nearest point of relief (be it a one club drop or a two club drop), you must use the same club to determine if the ball rolls more than two club lengths away from the drop area after the ball is dropped. Of course if no club is used to determine the drop area, then you can use any club to determine if the ball rolled more than two club lengths. Odd, but true! Decision 20/1. But...if you choose a shorter club to check if the ball has rolled more than two club lengths, the validity of the original drop must also be checked with that same club - maybe the ball was dropped outside the limit when that shorter club is used. That certainly seems to make sense, though it is something that I have never encountered. In order to avoid any such issue, I have a routine that I use when taking a drop. 1. Determine the nearest point of relief (or the point at which the ball last crossed into a hazard, as the case may be) and put a tee at that spot. This is tee A. 2. Select the club I wish to use to measure the one/two club lengths. 3. Measure the one/two club lengths and place a tee at that point. This is tee B. 4. Drop the ball so that it hits the ground somewhere between tee A and tee B. 5. Check to make sure that the ball has come to rest not closer to the hole relative to tee A. 6. Check to make sure that the ball has come to rest not more than two club lengths from tee B. For most golfers, this will occur at least once in almost every round so it is not an unusual occurrence. I would agree with you when a player wants to take advantage of the full extent of the relief available under the Rules. However, this is not the case with a majority of relief drops. The Rules do not require either position to be marked and in my opinion, when a player intends to drop well within the permitted area it is not necessary to mark and does not waste any time. A second point is that your routine does not comply with the Rules in that you must select the club with which you would play your next stroke to determine the nearest point of relief and must then use this club (not a longer one) to measure the two club-lengths (Decision 20/1). Barry, your last post is incorrect. Yes, the player should use the club he would normally use for his next stroke to identify the nearest point of relief but, when measuring club lengths, he may then use any club, including a longer one, to measure said club length. Determining the nearest point of relief is not measuring. Since Barry did not contest Anon's point that "determining the nearest point of relief is not measuring", I shall presume that Barry concedes that Anon is correct. My apologies, I do remember replying to the comment, as I always do, but for some reason it did not post. I absolutely concede that I was wrong in saying that the club used for determining the nearest point of relief must be used for measuring club-lengths. So, my reference to Decision 20/1 was not relevant to this point. Thank you both for correcting me. Just one question regarding the above discussion. Pint 6 of John Roethel's procedure has him measuring the two club lengths from Tee B (the outermost point of the dropping zone). Shouldn't the two club lengths be measured from the point where the dropped ball first strikes the ground? ...rolls and comes to rest more than two club-lengths from where it first struck a part of the course. I agree. That was a mistake on my part. And thank you for correcting me. Thank you. I recommend that you enter your email address in the top right corner and receive my weekly blogs, free of charge, as they are published? I can assure you do not share your email address with anyone. I have a question regarding the dropped ball. If a dropped ball lands on a tee that is used to mark the position of a ball and sits on the tee, how would you proceed? It depends! A tee used to mark the position of a ball, or the outside limit of the permitted drop, is not a player's equipment and therefore if the dropped ball lands on it, or rolls into it, there is no penalty and it does not affect the ruling as to whether the ball is in play, or not (e.g. the ball might subsequently roll nearer the hole, in which case a re-drop is required). However, in the case of a tee used to mark the limit of the area of drop it is a good idea to place the tee just outside the permitted area, leaning away from it. Then, if a ball is dropped onto the tee it is obviously just outside the permitted area, requiring re-drop, no matter where the ball may roll to. If the dropped ball lands on and sits on the tee that is used to mark the position of the ball, can you play the ball as it lies or do you have to remove the tee before the stroke? If you do have to remove the tee, do you have to drop the ball again? And what is the status of the tee once the ball is in play after ball is dropped? Is it equipment or movable obstruction? I have a question. If a re-dropped ball hits a branch of a tree before hitting the ground and rolls more than two club-lengths, do you place the ball on the branch or on the ground right below that. In the highly hypothetical situation where a dropped ball "lands on and sits on" the tee being used as a marker, the drop is invalid, as the ball has not hit any part of the course, as is required by Rule 20-2. You do not have to move the tee when you re-drop. As mentioned previously, the tee is not equipment when used to mark, it is a movable obstruction. In the even more hypothetical situation where a re-dropped ball hits a branch of a tree before hitting the ground and rolls more than two club-lengths, the player must place the ball where it first hit the branch of the tree, which is part of the course. To anticipate your next question, if the ball will not come to rest there the player must place the ball in the nearest similar lie where it will come to rest. Of course, if they do not want to play their next stroke from off the tree branch they can deem it unplayable and for another penalty stroke drop it according to one of the options in Rule 28. I do not think that these hypothetical situations are of any value to most golfers, many of whom struggle to remember the important principles of the Rules and so I will not be answering any more such questions on this subject. Ok what if your ball bounces onto the tee. Then what do you do? It hit ground first. This happened to me. Providing the ball first touched the course within the permitted area of drop the ball is in play. The Definition of Equipment excludes any small object used to mark the position of a ball and therefore the drop was valid. What happens if you leave your club in the ground and the drop the ball but the ball then hits your club. Is there a penalty? If the ball, when dropped, touches any person or the equipment of any player before or after it strikes a part of the course and before it comes to rest, the ball must be re-dropped, without penalty. There is no limit to the number of times a ball must be re-dropped in these circumstances.